With this calculator, you will be able to acquire your patient's heart rate from an ECG. You will only need to measure the distance between two R wave peaks – the RR interval. You can use either a ruler or a caliper and type in the result in millimeters or quantity of ECG boxes, you choose! But remember! If RR intervals between at least two ECG complexes are different, your patient might have an arrhythmia, and our calculator may give you a false result. Don't forget to check it! a way to use our calculator differently in order to get your patient's expected RR interval based on his or her heartbeat. Please note that using this calculator is by no means equivalent to a consultation with a specialist. If the result you obtained is troubling you, make sure to visit your physician! If you are interested in cardiology, don't forget to check out our cardiac output and stroke volume calculators! With the ruler: measure the distance between two R wave peaks. R wave, part of QRS complex (representation of depolarization of ventricles), is defined as the first upward deflection after the P wave (which represents atrial depolarization). While measuring, try to put your ruler parallelly to the horizontal lines on the ECG paper. With the caliper: place each of measuring tips of your caliper on peaks of subsequent R waves. Then, without changing the angle between the arms of the caliper, put one of the tips on an intersection of ECG paper lines (horizontal and vertical) and the other tip on the same horizontal line. Count the number of ECG boxes between the tips of your caliper. A small box represents 1 millimeter while the big box measures 5 millimeters. Check the lengths of some other RR intervals. If there are differences, your patient might have an arrhythmia! This calculator is not suitable for calculating the heart rate of patients with irregular heart rhythm. For more information, check out the 6 second ECG paragraph! Put the result of your measurement to the corresponding field: RR interval for length in millimeters, number of boxes for length in boxes. If you chose to measure RR interval in boxes, select the type of boxes. Choose the ECG paper speed. The standard is 25 mm/s, but sometimes a 50 mm/s option is preferred. Read the ECG heart rate in beats per minute! A physiological resting heart rate for adults should be between 60 and 100 beats per minute. A slower heart rate is called bradycardia, a faster – tachycardia. In children, normal heart rate ranges change with a child getting older. During physical activities (for example training) our heart beats faster to ensure that our muscles receive enough oxygen supply. The bigger the effort is, the higher heart rate is being achieved. You can check your maximal safe heart rate with our max heart rate calculator. ECG paper has a speed of 25 mm/s (occasionally 50 mm/s). It means that a distance on the horizontal axis between two points (for example two peaks of subsequent R waves) on ECG paper corresponds to a certain duration. With your caliper, count the number of big or small boxes between two R wave peaks. Divide 300 by the number of big boxes or 1500 by the number of small boxes. You have your patient's heart rate! Count the number of R waves in 6 seconds or 30 boxes ECG strip. You have just estimated your patient's heart rate. Congratulations! You can use our calculator in a different, reversed way. Let's say you have measured patient's pulse and want to check whether it's corresponding to his or her heartbeat. Unfortunately, you forgot your stethoscope. You order ECG and, while waiting for results, you type in the number of beats per minute you expect your patient to have after the pulse check. 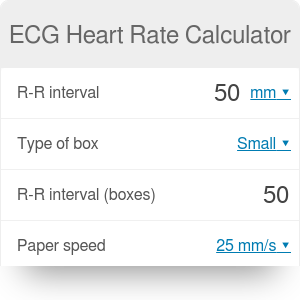 Eventually, having the ECG paper in front of you, you only have to verify whether the RR interval length (in mm or boxes) on paper corresponds to the results which you have obtained with our calculator. ECG Heart Rate Calculator can be embedded on your website to enrich the content you wrote and make it easier for your visitors to understand your message.